After many, many weeks of internet stalking, I was finally able to land an interview with Christopher Tourre, co-owner and brewer for Chicago upstart Arcade Brewery. Chris’s business partner, Lance Curran, was unable to make it but he was there in spirit as Chris enthusiastically laid out the duo’s business plan. An arcade is a communal, fun, playful area and Chris and Lance want to harness that mindset with their brewery. They chose the name “Arcade” because they wanted to tap into that high-end nerd culture of design, games, and fun, and stress that they will be making good beer minus the pretension. Chris and Lance have been friends for about three years and met, oddly enough, in a noise rock band while Chris was in graduate school. Lance, who works for threadless.com, immediately wanted to be a part of the brewery when Chris mentioned it to him. While Lance has limited if any homebrewing experience, he is a craft beer lover and has been indispensible with regard to creative marketing and getting the message of Arcade out there. Chris got the idea for the brewery from various art projects he was involved with while working on his MFA at the University of Illinois at Chicago. He was interested in social, community-based projects such as delivering eggs or inviting neighbors over to churn butter. Chris, who had been homebrewing for a while, felt that this community aspect would communicate beautifully into the brewing world. He began hosting tastings and would meet individuals who would suggest (and sometimes provide) various ingredients, telling him to make a beer with them. He noticed that there was excitement “brewing” at the prospect of having a stake in the beer. Arcade wants to foster this sentiment and is looking to the public to provide adjuncts and design labels. Chris says the theme of the brewery is “from conception to consumption,” meaning that the community will be involved in the entire process, from start to finish. Arcade will have a few signature, year-round offerings such as the 8 Bit Grapefruit IPA but the seasonals and one-offs will incorporate input from their customers, tapping into what their customers want. When I commented to Chris how it seemed that Arcade has grown really fast, I was expecting him to say something along the lines of “No, actually we’ve been working at it for a long time and we’re just now starting to get some notoriety.” This isn’t the case, though. If it seems like Arcade has come out of nowhere and is moving at lightning speed, it’s because it is. 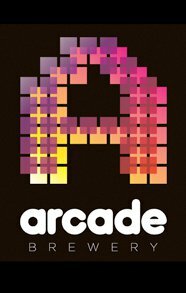 Arcade was founded in March of this year and is slated to begin selling beer in early summer 2012. It is all happening so fast, they can’t keep up; there is currently over-interest with regard to bar accounts. While they anticipate they will have a few bar accounts where they will be on draft, they want to focus on bottles. “Bottles are a blank canvas,” says Chris. He is excited about having art competitions where the winning design will be featured as a bottle label. There will also be a series called “six pack stories” where graphic novelists will illustrate and communicate a story on the labels within a six-pack of beer. Chris says they “just want to jump into the Chicago craft beer market as soon as possible.” However, for the time being, they are making sure that everything is in order from a legal standpoint. Chris hopes to keep all operations of the brewery transparent, even going as far as having live streams on the Arcade website to allow customers to watch the goings-on within the brewery. He also wants graphical representations that will allow people to see at what stage in the brewing process a particular beer is currently. Chris explains there are all sorts of ideas that he and Lance are kicking around right now that he hopes will instill a brewing culture and educate his customer base. 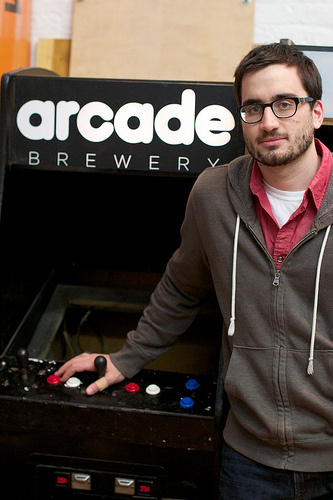 News recently broke that Arcade will be utilizing the equipment at New Chicago Beer Company (they met the Evans brothers at an Arcade Brewery beer tasting) to brew their beers and are looking to start brewing and selling their wares in early summer 2012. Chris stresses that this is not a contract brewing relationship; it is more of a turnkey relationship, meaning Arcade will be brewing pretty much whenever New Chicago isn’t. New Chicago is slated to begin selling their beer in early March 2012 so there will not be overlap between the two breweries’ release. Chris and Lance are excited to establish themselves in the market and get their feet wet. If you are interested in learning more about Arcade Brewery or have an idea for a brew that you would like to share with this duo, Chris and Lance will be at this weekend’s Beer Hoptacular at the Aragon Ballroom. Unfortunately, due to licensing issues (i.e., they don’t have one yet) you won’t be able to taste any of their beer at this event. But, at the rate that this brewery is growing, it won’t be long until you can try their beers.